First, a word of warning to other BSH reviewers. You’re not safe in the privacy of your own home! Yesterday, in the post, I received, not just one, but two CDs for review. Homework, the note said. As with gangsters, do not let Lance Blogmaster know where you live. When I saw him later, he blithely told me, “I have Liz reviewing a gig in York tonight”. So you’re not even safe in your hometown irrespective of the distance! But I had my reward, as this CD is superb, consisting of songs from the Gasbook, ‘60s/’70s songwriters and two more recent songs – Cee Lo Green’s Crazy and Sam Smith’s Stay With Me. Without a doubt, my favourite item is the title track, Love For Sale, sung as a narrator describing the woman’s situation with obvious sympathy, which was surely what Cole Porter intended. “Just climb those stairs” is sung with almost a snarl to show dislike for the young prostitute’s customer. I especially liked Some Enchanted Evening, with its gentle-voiced opening by guitar, bass and vibes and the mayhem of the full band on Crazy. The notes aptly describe the band as impeccable studio musicians and there are lots of solos from the horns and Sankovich on organ. 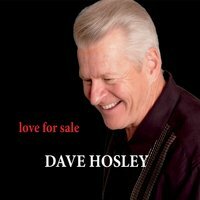 Hosley’s voice has a light, pleasing tone, and this is his debut CD, recorded after more than four decades of performing in the San Francisco Bay Area. If he ever crosses the Atlantic I reckon he’d go down a storm at Hoochie Coochie. Other tracks: I Feel the Earth Move; I Say a Little Prayer; Crazy She Calls me; Blue Skies; Lush Life; Something’s Gotta Give. Available on Diamond Dave Records. Dave Horsley (vcl); Greg Sankovich (pno/org/keys); Paul Eastburn (bs); Alan Hull (dms); Michaelle Goerlitz (perc); Lincoln Adler (alt/ten/bar); Dillon Vado (vbs); Matthew Hewlitt (gtr); Mike Olmos (tpt); Allison Gorner (tmb). Thanks Liz, I feel great now apart from my left ear, but that's a whole other story, too boring to put on BSH. CD Review: Ron Stabinsky - Free For One. Situation Vacant. Manager required for the Globe. CD Review: Mike Jones Trio - Roaring. CD Review: LaVon Hardison - Come Together. Val Wiseman swings for the National Jazz Archive! George Benson @ Sage, Gateshead - June 21. CD Review: Redemption - Sands of Time. Swing Manouche @ Gala Theatre, Durham. June 17. Doug Raney (August 29, 1956 - May 1, 2016). Tomorrow night @ The Jazz Café - June 14. LP/Digital Review: Harry Beckett - Still Happy. Friday (June 3) Gig Cancelled at Jazz Café.